On May 11th, e2k produced the 21st Annual Conference of the Professional BusinessWomen of California. Over 3,000 of the Bay Area’s leading business women gathered for a day of learning, connecting, and inspiration. 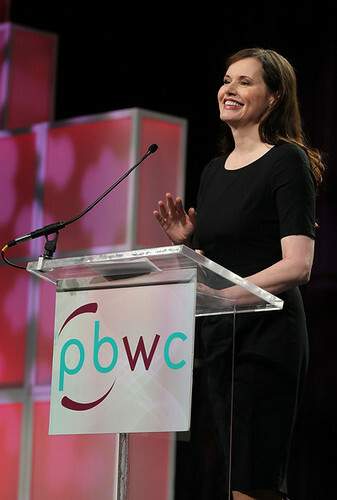 Keynote speakers included Actor, Film Producer, and Writer Geena Davis; Pulitzer Prize-Winning Author Sheryl WuDunn; Health Expert and host of VH1’s Celebrity Fit Club, Dr. Ian Smith; Oracle President Safra Catz; San Francisco’s First Lady Jennifer Siebel Newsom and U.S. Congresswoman Jackie Speier. The conference also featured a performance by the lead of Wicked, Felicia Ricci, an interactive exercise with Drum Café, ten seminars and workshops, a Young Women’s Summit with 300 high school girls, a Senior Executive Forum, and an expo hall filled with over 100 exhibitors, celebrity chef demonstrations, fitness classes and more. The event was produced by Lorie Murphy, Katie Doherty, and David Gill. Graphics and internet marketing by Meghan Harris. Technology and venue coordination by Trisha Ricci. Young Women’s Summit and Volunteer Coordination by Tina Campos. Registration Coordination by Allison Hahn. Media and Publicity by Kenny Wardell. Expo Development by Stefanie Liang and Sara Jane Keskula. And Technical Direction by Mike Brady. The on-site team also included Michael Olmstead, Erin Olmstead, and several e2k Associate Producers and extended staff including Cathy Dangler, Bryan Greenwalt, Brad Robinson, Ian Mayne, Mark Bethel, Rocky Orozco, Victoria Starr, Ali O’Leary, Jen Krottinger, Shannon Smartt and Peter Dergee. Special thanks to all who made the 21st Annual PBWC Conference a shining success!